Time for me to weigh in on the Baby Jogger City Mini debate! The City Mini is definitely for some people, and definitely not for others. If you're more than 6"0, then it's not for you. If you don't have a car, then it's not for you. If you live on a third floor walkup, it's definitely not for you. But if you're an average height, driving, ground floor living kinda guy, then I would definitely recommend it. The problem is, first of all, that I can't push it without my knees banging into the back (try it in the store before you buy it, for sure. But make sure you're trying it with the seat fully reclined if you plan on using it at all for your baby's first six months or so of life). If this is an issue for you, but you still like Baby Joggers, then I'd recommend checking out the City Elite, or the City Classic. Both are much more accommodating for us taller types. 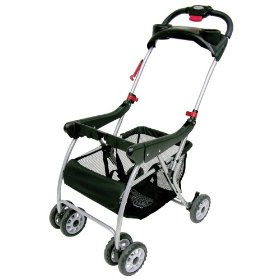 The Baby Trend Single Snap N' Go Stroller is also a good solution. Though no taller than, and possibly a bit shorter than the City Mini, the Snap 'N Go seems just a little bit better designed, and doesn't bang against my knees (as often). 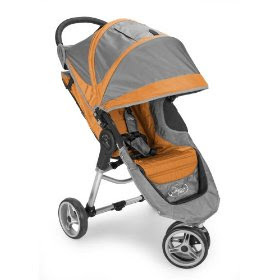 Assuming you have a car, then you're not likely to have to drag stuff along with you on long hikes with the stroller, so the City Mini ought to be ok for you. If you walk to most places you go to, like Sarah and I do, then you'd probably prefer something with a bigger basket (The City Mini sports a tiny little basket that you need to pay extra for*. It's good for a folded raincover and about half a diaper bag). The Snap 'N Go Infant Car Seat Carrier fits the bill for us carless types, for two good reasons. It's got a huge basket (For me, the ideal basket is one that's legally bound to say "Please do not put your baby in the basket"), so you can totally do your grocery shopping without a separate shopping cart. The easy Car Seat functionality also makes it super convenient for jumping in and out of taxis quickly, because let's face it, us walk-everywhere types quickly become taxi-taking types when faced with a screaming baby. The Snap 'N Go is also great for walk up apartments like ours because it's so light-weight. We just detatch the carseat and walk it us, and leave the frame under the stairs (something we'd never do with the $200 City Mini). So, anyone looking to buy a slightly used City Mini? *Apparently, you don't pay extra for the basket. Thanks Sarah for the correction. The basket is still too small though. You don't pay extra for the basket for the City Mini. It's actually one of the very few things that is included in the price. Also large baskets are pretty rare and the City mini is actually on the larger size of the lightweight class, sorry to say! If you want a workhorse of a pushchair you have to get a big heavy thing and then load up the handles too. My Silver Cross was always good for that even though the basket was pretty bad for accessibilty. Maclarens strollers have smaller baskets than the City Mini so don't get too excited about that aspect! If I were you I would get a sturdy pram and then change back to your City Mini when your baby is older - really, you don't realise how useful it is going to be! Also when your baby is in the next size up of carseat (around 9 months), you will no longer be able to take a carseat with you, so taxis won't really be an issue any more. Or maybe you should just use your carseat carrier permanently for now and forget about buying a new pram and then at 9 months when your baby is way too big for the carseat, go back to the City Mini? Personally I agree with you that it doesn't seem appropriate for a newborn, but you have to look further ahead than that before you sell it for good! Plus you won't find a better sun canopy and that's an issue in Israel isn't it? Or will you just buy a big UV shade? Wow - have just written a megillah - sorry! Hope you are having a great Pesach (much more of a nightmare when you have an older toddler demanding rice cakes all day long!!). Since this blog is called Baby things "I want", I think you should check out the following link. If money was no oject (ha! ), this is the one I would get. Check out the video clip especially how it handles stairs!! I'm thinking about getting a graco metrolite, big basket, extending handlebars, and about 17 lbs. I know gracos are kinda dorky, but it seems like it's my best match. I'll blog about it more. And yes, the city elite is nice, but i'm not leaving it outside for a cat to pee on and i'm certainly not shleping it up our 3.5 flights of stairs. Having said I love my City Mini, I have actually found it a bit difficult on stairs. Never really been an issue for me in flat London but recently I had to go up some and I see your point of view! But I still think your hubbie is never going to be truly satisfied, sorry Menachem! Just Googled the Graco - ok, doesn't have the sleek modern look, but wow, what a basket!! And it does tick all your boxes. Good luck with it! wow, good to know about the recall. will look into it. p.s. i've been much happier with the city mini lately. it really is good, lightweight, convenient, comfy.